Lighting and decor create an unforgettable ambiance for any event space. Any venue can be transformed by decor and lighting to give everything a tangible, elegant feel. This black velvet drape with twinkling lights is perfect for staging. We have two drapes each 20' wide by 13 ' tall. The installed lights are full RGB and therefore any color, fade pattern and speed can be programmed to suit your event. White benches, sheer curtain end tables and flooring all work together to create a modern sleek look. 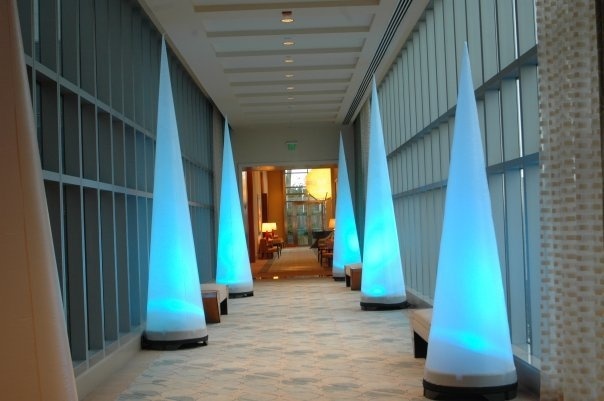 Design a striking entryway with these 12' tall cones. Using the same bases as the Airstar Cones, this arch lights the way.